Sunday’s Wash provides non-toxic, biodegradable detergent for everyday and nursery laundry. Packaged in reduced, reused, and recyclable paper, the creator is both environmentally and family conscious both in the product she makes and the delivery. Think that reusing is boring? 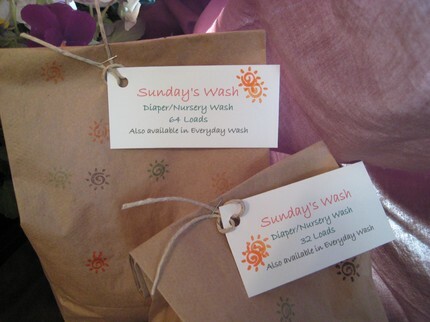 Think again– Sunday’s Wash packaging is hand assembled and stamped with suns in fun vibrant colors! The owner of Sunday’s Wash, Cindy, developed her Diaper/Nursery Wash to be comparable to Allen’s Naturally powdered soap. According to her website, “special enzymes help break down spit-up, baby food, and all sorts of baby messes,” leaving no residue on clothing. I was pre-warned that the soap doesn’t really suds up, but that this isn’t necessary for clean clothes. 1) It works well! No leftover smells or leaky diapers. 2) There is a slight odor when first dissolving the soap (the powder needs to be dissolved in water prior to adding to machine unless you have a HE washer), but this goes away and the clothes don’t smell after washing. 3)You should use the amount that Cindy recommends, not half the amount as is commonly done when laundering diapers. Buy It! The cost of using this product is minimal–$0.18 a load! This is a product that you can feel good about. It cleans well, keeps money in your pocket book, and even the plastic baggies that the powder comes in are reused from a children’s clothing store. Also, if you enter this contest, you will be getting 1/2 off of your shipping when placing an order (mention that you entered the Life More Simply Blog contest!). Win It! Sunday’s Wash is giving away 5 loads of sample packs to one of my readers for free. To enter, please visit her site and tell me one ingredient in her soaps. Everyone had better not tell me the same ingredient! Leave an email address and separate comment for each entry. Contest ends August 11, 2009 at 1530, EST. * Otherwise spreading the word about this contest! One of the ingredients in Cindy's soap is sodium borate. I have your diaper giveaway button on my blog. I have your life more simply button on my blog. One ingredient is Oxygen Cleaner. Sounds like a wonderful detergent and I'd love to try it on my dipes! I requested a sample of Cindy's detergent. One ingredient is sodium carbonate. I'm an email subscriber (xpblochATjunoDOTcom). I see that she uses oxygen cleaners in her soaps. Requested a sample as etsy user anathica. This contains water softener. This sounds like a great product for a very reasonable price! Another ingredient is Soil and Stain Removers. Thanks for this giveaway and please count me in. I Contacted Cindy Bylsma and requested a sample of her detergent.